This weekend I kept it casual and rocked some new purchases I have been dying to wear, but haven't yet had the opportunity for. For me, I like to make purchases of items I would wear both at work and outside of work to get a better return on my investment. 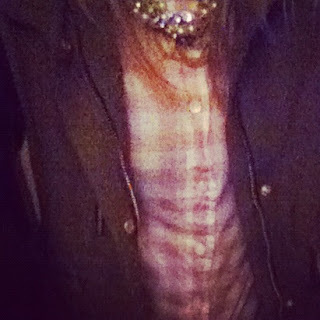 This weekend I wore some work appropriate statement necklaces, some gingham, and my new favorite coat from Zara (not as work appropriate, but I will be wearing this as often as I can). Here is an instagram snapshot of a weekend outfit. What are you wearing on the weekends? To my readers, would you be interested in more outfit posts? If so, let me know. YAY! Love weekend style. Yours is great. Love the shot of sparkle!